Business value, the north star of Agile, Lean and DevOps champions, is often more difficult to determine than one would imagine. 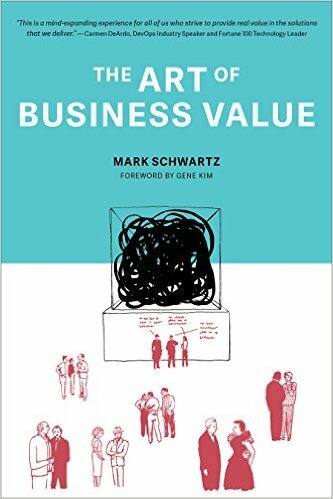 This book takes the reader on a journey to discover that value while along the way, creating helpful mental models, challenging preconceived notions and proposing some creative ways to transform an organization. The author does a great treatment of ROI (Return on Investment – does anyone ever really measure that? ), NPV (Net Present Value), MVA (Market Value Added) and SVA (Shareholder Value Added). I especially enjoyed the humorous practical example that revealed a surprising truth that acquiring an MBA can easily have a negative NPV (in other words, a bad investment!) So save your money and pay attention to the author’s “four-paragraph MBA” (p. 20) that unpacks the main two principles learned in an MBA: 1) There is time value of money and 2) A business venture needs a sustainable competitive advantage. Legacy IT architecture and bureaucracy are often considered negatives and obstacles to progressive competitive relevance but the author brings a refreshing perspective on the “value” of that complex hairball of legacy and rules and the right way to polish and transform them. I highly recommend this book to IT leaders, digital executives, strategic managers, and anyone seeking to make their organization more agile, effective, relevant, competitive and humane.